It’s a Good Weekend for Gamer Me! Hello, crafty and sundry! This one is mainly for the gamer sorts, hee hee. In the past week or so, I have gotten massively hooked on the Tropico franchise. I’ve had 3 and 4 for awhile, but hadn’t really given it a good go. I’d poked at 3 briefly some months back, but the tutorials were a bit vague for my tastes. There are a lot of factors that go into having success in the game, and it didn’t really give me more than a window into that (cue panic). But I had gotten bored with Colonization after a hefty jag, so I booted up Tropico 4 to see if it made a bit more sense. It made enough sense that after playing through the tutorials, I popped back to 3 and didn’t do a completely horrible job. I didn’t do a great job either, but that’s okay. Where as my default anxiety state used to be so high that this sort of game would’ve caused me a nervous breakdown. But based on bouncing between 3 and 4, I felt 3 was harder, so defaulted back to 4 for a bit more self-tutelage. I’m managing to play the game without getting destroyed by rebels, the US, or the USSR, and my people are happy, so it’s fun and compelling. Of course, watch I try a free map instead of one of the scenarios and everything goes to crap, ha ha. So it was VERY pleasing and surprising to log onto Steam yesterday and note that the entire franchise is on sale. I might have flailed and squeaked, because I had just Tropico 5 on my wishlist with the intention to get it for Christmas. But you know how sometimes things line up juuust right for you to jump on an offer when it shows up? Well. *laughs* I’d seen how much the game was going for on Playstation 4, and then saw it for less on Amazon, and then a little bit less on Steam… and then even less. I’ve not checked out 5 yet, but I’ve got the DLC loaded up on 4 and am continuing to have a smashing time. 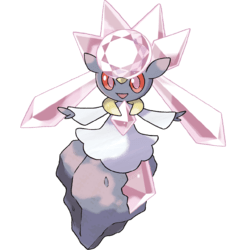 Diancie is the epitome of cuteness. I was checking my Twitter, as you do, when I saw the news I had been waiting for — that the Pokémon Diancie was available. Look at this majestic pile of pixels, yo. That’s one adorable Pokémon. I’ve also declared it to be the Pokéform of my soon-to-be sister Shansbat (who loves her rocks), which makes it extra special to me. It’s also one less Mythical Pokémon that I don’t have (the ones I’m missing now being Mew, Jirachi, Shaymin, Victini, Manaphy, Meloetta, Genesect, Hoopa, and the not yet released Volcanion). I don’t really have the highest hopes of getting any of these that I don’t have, but who knows. Maybe they’ll come back up. I seem to have a random profusion of Darkrais, for example. Maybe someone would want to trade me for one of those. Or maybe I can ask around my fellow PokéAddicts and see if anyone is willing to let me borrow any of those momentarily to get a properly ‘actually’ filled Pokédex. We’ll see. I might also have better luck once I get back on the ball about grinding for shinies, hee hee. I’ve been a big slugabed about my knitting, but the cardigan is coming along. I finished the first front panel, and am a bit over halfway towards being done with the second. I have to triple check my assorted maths so it comes out approximately right though. I already fubared a bit on the buttonhole spacing, but I think I can get away with it as is (the first three holes are wider apart than the last two). I guess it gets to be one of those little things that makes it custom, hee hee. I’m not doing any little knits right now, but that might change. That doll still needs clothing. I know that this top is going to be my next big project; I’ve already got the wool purchased and stashed for it. It looks easy enough, but with a little bit of flash in the form of that gorgeous cabled neckline. Knitting is exciting fun, hee hee.